PITTSBURGH - April 4, 2018 - PRLog -- . Discovered several years ago, the transparent DF2 galaxy containing globular galaxy clusters was recently reviewed  for the presence of dark matter. DF2 stands for NGC 1052-DF2. Dark matter was inferred from the velocity V of the clusters, i.e., fast moving clusters suggesting dark matter is present in holding the clusters together, but if slow moving, dark matter need not exist. Cluster velocities were inferred from the Doppler effect using redshift Z from absorption lines of the calcium triplet state. For Z <<1, the galaxy velocity V ≈ Z*c, where c is the velocity of light. On this basis, dark matter in DF2 was not found because high cluster velocities V common to galaxies thought to have dark matter were not measured. Dark matter is not real, but rather an overstatement of measured velocities of galaxy clusters that includes redshift by cosmic dust giving the impression dark matter mass must be present to hold the cluster together. If the Universe were in fact transparent like DF2, the velocity of a galaxy inferred from the redshift of light by the Doppler effect shift would be correct. But cosmic dust permeates the Universe, and therefore valid galaxy velocities require correction for redshift in dust. 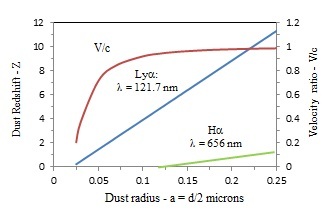 Redshift of galaxy light in cosmic dust is a consequence of light-matter interaction of a single galaxy photon with a nanoscopic dust particle, as multiple interaction of galaxy photons with the same dust particle are unlikely. The interaction of the galaxy photon as a real photon is described by simple QED unrelated to the complex theory of virtual photons proposed by Feynman. Simple QED is a consequence of QM that by the Planck law requires the heat capacity of dust to vanish under high EM confinement induced by high S/V ratios that requires heat to be deposited almost entirely in the dust surface. QM stands for quantum mechanics, EM for electromagnetic, and S/V stands for surface-to-volume. Since QM denies dust atoms heat capacity, the heat of the galaxy photon absorbed in cosmic dust does not increase temperature. Precluded from thermal expansion, the surface heat places internal dust atoms under the high EM confinement necessary for heat capacity to vanish. If the measured redshift is corrected for the redshift in cosmic dust, there is no need for dark matter to explain an expanding Universe or the rotation curves in spiral galaxies suggesting the Universe is dynamic, but otherwise static and infinite.